Now for the exciting bit – buying plants! It’s really fun researching what plants I want to have in my tropical paradise. First and foremost is finding plants that will be happy living in the UK. I’m lucky so be living in the south of the country and we don’t get very harsh winters so I’d imagine most sub-tropical species would do OK in the summer months but may need some protection in the coldest months. I’m new to growing tropicals, well, only I’ve only grown ones you’d grow as annuals like geraniums, tomatoes, etc so research is king. My neighbour successfully grows Canna Lilies in her north facing front garden so that’s where I started. 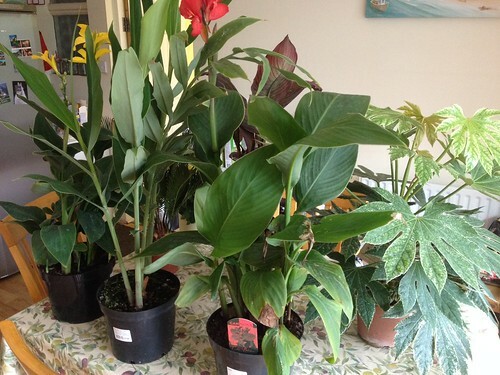 I bought two Canna Generalis and a Canna Tropicana Durban. It’s a start, I’ll probably buy some others but it’s got me going. Next, I did some research on ‘typical’ tropical plants to get that jungle look. I love flowers (I have a wildflower bed) but what I’ve found is for the right look I’m going to need foliage, foliage, lots of leaves and maybe some foliage. The most iconic of all ‘tropical’ plants is the Fatsia Japonica. Growing to the height of 3-4 metres and the same in spread with large hand shaped leaves around 40cm in width it’s a fantastic plant, but sadly I think it’s a little overkill for my little patch. However, I found in my local nursery a variety called Fatsia Japonica ‘Spider’s Web’ which is a smaller variety (only growing to 2.5 metres height and spread) with pointier leaves, fringed, almost decorated with white lines. It’s very pretty and would slot in perfectly. I have read a lot about gingers, I’m not talking about people of a celtic ancestry but rather the plant. They seem relatively hardy in the UK (again, the plant), dying back to the root over winter and requiring only a good mulch over the coldest weeks. They also spread along the root, forming a clump of plants which can be split once established. I was on the lookout for a Hedychium or Ginger Lily as it’s commonly known, which is a nice plant with large fleshy leaves and a lovely looking spike of sweetly smelling orange flowers. Fortunately I happened upon one almost straight away in the same nursery I got the Cannas in, so that went in the basket straight away! As a bit of an impulse buy, I also purchased a Cycas or Sago Palm. I’d seen one on a balcony earlier in the week and thought it looked rather nice and, well, tropical. Once I got it home I realised it’s more of an indoor plant in this country so I’ll leave it in a pot and only put it out over the summer months. Unfortunately as it’s late October, I can’t put any of them in at the moment so will have to wait until spring. They’ll be happy in my greenhouse until the last frosts have passed and then they can get established in the ground.